A new five disc set collecting Scottish indie music is set for release on February 22nd. 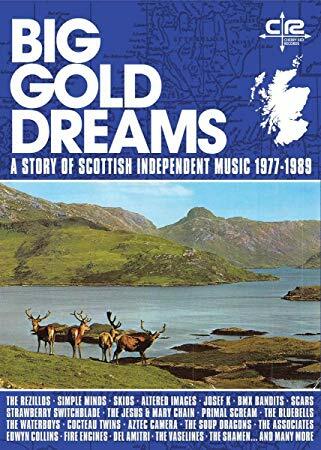 Named for the 2015 Scottish music documentary, Big Gold Dreams A Story Of Scottish Independent Music 1977 - 1989, is a mix of cherished favorites, classics and rare, out of print tracks from The Jesus and Mary Chain, Cocteau Twins, Primal Scream, The Waterboys, Fini Tribe, Aztec Camera, The Submarines, Strawberry Switchblade, Biff Bang Pow, Altered Images, Simple Minds, Close Lobsters, The Beat Poets, Goodbye Mr. Mackenzie (Shirley Manson's old band), and so many more. View the tracklisting below and head here to pre-order. 22. The Laughing Apple - Participate! 10. Jasmine Minks - Think! 19. The Incredible Blondes - Where Do I Stand?